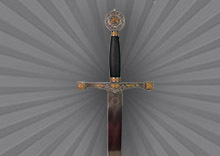 Excalibur is the mythical sword of King Arthur, sometimes attributed with magical powers or associated with the rightful sovereignty of Great Britain. Sometimes Excalibur and the Sword in the Stone (the proof of Arthur’s lineage) are said to be the same weapon, but in most versions they are considered separate. The sword comes with free engraving up to 20 characters along the blade. It will also include a wall mounting fist. The full length of the sword is 41 inches and it is 5.7 lbs in weight.